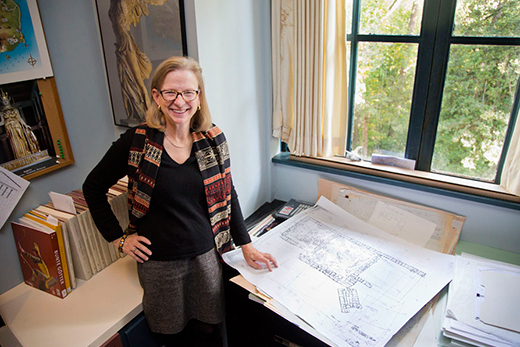 Emory art history professor Bonna Wescoat describes 2015 as a "bumper year" for grants awarded to Emory to fund projects in archeology and architecture. Awards from the Partnership University Fund, the National Endowment for the Humanities and the National Geographic Society will support Wescoat and her team's study of the Greek island of Samothrace. "We won three grants. They just poured in at the same time," Wescoat says. "I'm excited about all the projects, each of which has different parameters that will expand our understanding of the Sanctuary of the Great Gods and its relationship to the larger Mediterranean world." "Never in my wildest dreams was I expecting to get all three," she says. Wescoat is director of excavations at the site where the famous Winged Victory statue, now in the Musée de Louvre in Paris, originated. Senior team members from Emory include William Size and Michael Page (Environmental Sciences), Vicki Hertzberg (School of Nursing), and Elizabeth Hornor and Jasper Gaunt (Carlos Museum). Team members also include Emory graduate and undergraduate students from several departments, as well as students from a partner institution, the Institute of Fine Arts of New York University, and faculty (several of them Emory graduates) from other institutions in the United States, Greece, France and the United Kingdom. The first grant Emory scholars learned about is a three-year award that extends and enlarges Wescoat's work on Samothrace. "North Aegean Architectural Networks: Thasos and Samothrace in the Formation of Hellenistic and Roman Design," a partnership project between Emory University and the Université Bordeaux-Montaigne, was selected for funding by the Partner University Fund (PUF), a partnership of the French American Cultural Exchange (FACE) and the Cultural Services of the French Embassy in the United States. FACE praised the "scientific quality" of Emory's research and the university's commitment to the project, according to Pauline Pedexes, program coordinator for the Partner University Fund at the Cultural Services of the French Embassy. Wescoat says the grant "allows us to work very closely with French colleagues who have been working on the nearby island of Thasos for many years. Some of the materials on Samothrace are imported from Thasos because they have good marble and we don't. "Everyone had assumed Samothracian architecture is closely connected to and derivative of Thracian architecture," she says, but Bordeaux scholar Jacques des Courtils questioned this assumption. "And that got us going," Wescoat explains. "We want to investigate the whole network of influences because there are definitely connections but also lots of differences; the islands dance around each other and the wider northern Aegean as they trade in materials, ideas, design and technology." Wescoat and des Courtils are the principles on this project along with Laurence Cavalier from Bordeaux-Montaigne and William Aylward of the University of Wisconsin at Madison. Another exciting aspect of the PUF grant, Wescoat says, is that it will help train up-and-coming scholars in the field. Each year for three years, five French and five American graduate students will be selected to join in the research, participating in a long-distance learning seminar followed by three weeks in Greece. "We're interested in encouraging the study of architecture and in building international communities of scholars," Wescoat says. "[The students] are going to meet colleagues that they will carry through with for the next 20-30 years." The PUF grant allows the scholars to explore the network of connections between the two islands, and their influence spreading out into the North Aegean. While the goal is to publish a volume of essays and writing on the work produced by the PUF grant, "I think that what we really want to do is come up with new paradigms for the study of ancient architecture — 21st century ways of thinking," Wescoat says. "The interest in looking at how ideas are communicated, as much as how they are deployed, is central to our study." The National Endowment for the Humanities grant, called "From the Vantage of the Victory," will support the major investigation and publication of the region of the Sanctuary of the Great Gods where the Winged Victory of Samothrace originally stood. This area, which included the theater and stoa as well as other major votive monuments, was the performative heart of the Sanctuary. "By drawing on approaches to space, memory and identity to investigate cultural interaction and community creation in this evocative place," Wescoat says, "our work aims to provide a basis for engaging the spatial and experiential issues at stake in understanding sacred places." "We are looking specifically at one area of our Sanctuary, drilling into its archaeological and environmental configuration and focusing on how its particular constellation of monuments and buildings came into being," she explains. "Through this research, we hope to resolve some puzzles, including the design of the precinct that originally enshrined the Winged Victory, one of the finest examples of monumental sculpture from the Hellenistic Mediterranean." A central goal of the NEH grant will be the publication of record for this important region, but the team will also make their research available to broader audiences through their website, www.samothrace.emory.edu. The NEH grant will culminate in an international symposium to be held at Emory and co-sponsored by the Carlos Museum. The third grant this year is an award by the National Geographic Society. Two years ago, Wescoat says members of National Geographic talked to her about a major article on ancient Greek religion they were planning to publish in their magazine in June 2016. They were particularly interested in mystery cults and in cults involving women, so the Sanctuary of the Great Gods was perfect. "Apparently, the magazine had sent someone to Samothrace and determined that they couldn't really get the imagery they wanted. So they asked, 'Could we use your model?'" Wescoat recalls. When she responded that the Samothrace model was made in 2011 so "we feel like it's vintage now," the National Geographic team encouraged her to apply for a grant. It will be to build out the model of the Sanctuary at its greatest extent. "We're going to throw a lot of energy into modeling exactly what the site might have looked like," she explains. "We want to correct the buildings in our original model and we're going to work especially on the landscape and the atmosphere. And we're going to build out the most important interiors. " The model will include animations "where the camera is set at eye-level, leading the viewer through the Sanctuary and into and out of buildings, following the path of the ancient initiate," Wescoat says. "It's going to follow the principles of our original model but be a whole lot sexier." Work on the National Geographic grant already begun, while the two larger grants begin in January, she notes.